Asbestos has since been outed as a health hazard due to risks imposed by its exposure. This hazardous material was once a popular building material due to its versatility, fireproof and low cost – Unfortunately, many houses and buildings built before the 1990s have had, or still have asbestos present. Asbestos is most dangerous when it’s been disturbed, often a regrettable consequence of regular remodelling and renovation projects. Two forms of asbestos was manufactured for construction purposes. Asbestos has typically been manufactured in two forms for construction purposes. The friable form of asbestos comes in a soft, crumbly, wool-like state. The other form of asbestos, non-friable, comes in hard or rigid building materials. Because of the critical health consequences related to asbestos, it must be removed by a licensed professional. Friable asbestos removal requires a Class A license, and non-friable asbestos removal requires a Class B license. Hazaway Asbestos Removal is a licensed, professional Class B asbestos removal company in Melbourne, serving it and the greater Melbourne area. However, we do more than just take remove asbestos from a building. We offer comprehensive asbestos removal Melbourne solutions. Professional Asbestos Removal – We located and remove asbestos in Melbourne in a safe, swift, and efficient manner. Safe Asbestos Disposal – Due to its hazardous nature, there are certain specifications for asbestos disposal in Melbourne as dictated by the Environmental Protection Authority (EPA). Hazaway Asbestos Removal is licensed to dispose of asbestos within the mandatory parameters. 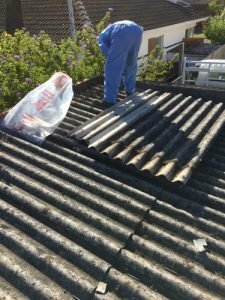 Asbestos Encapsulation – In the event that full removal of asbestos is more hazardous than leaving it in place, we can create a seal to sequester the dangerous material. Quality Asbestos Testing – Even the most discerning professional eye can sometimes have difficulty determining if asbestos exists within a material. Hazaway Asbestos Removal can arrange for the material in question to be analysed. Asbestos Air Monitoring – Hazaway Asbestos Removal can assess the air quality in a given space to detect any appearance of asbestos fibres. Asbestos Clearance Certificates – We issue clearance certificates confirming the safe and complete removal of asbestos in the building. What makes Hazaway Asbestos Removal the right choice for your asbestos removal in Melbourne? Hazaway Asbestos Removal specialises in Class B asbestos removal in Melbourne. We are fully-insured and licensed by Worksafe Victoria and the EPA. Hazaway technicians are experts in their craft, and completely knowledgeable on the safety standards and protocols surrounding asbestos removal in Melbourne. 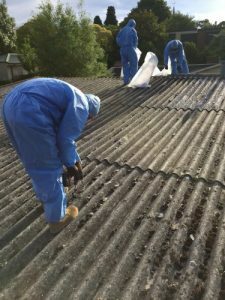 We offer our asbestos removal services in Melbourne at a reasonable price, providing high-quality dependability and expertise. We make it our mission to complete our Melbourne asbestos removal projects swiftly to allow you to get back to your normal life as quickly as possible, with the peace of mind that the asbestos on your property is no longer a worry. Your health and comfort is our priority! Interested in more information about Hazaway Asbestos Removal Melbourne services? If you would like more information about asbestos removal in Melbourne, or would like to get an easy, free quote, give us a call today at 0432 622 292. We are here to answer any questions you may have and want to ease your asbestos removal concerns!